Morocco, more than just a place to see, is a place to feel. The colors, the spices, the sounds of the bustling souks (markets) and the calls to prayer -- it will overstimulate you in a way only certain special places can. Few cultural meccas are more eclectic than Morocco, located at the confluence of not just the country’s North African neighbors, but of Portugal and Spain, of the Atlantic Ocean and the Mediterranean sea. Upwards of 10 million tourists visit every year, but most of their time will be spent in big cities like Casablanca, Marrakech, and Fes. Yet the country is as geographically diverse as it is culturally diverse, changing from deserts to rugged mountains to coastline sprinkled with surf towns. These regions outside the city centers are, naturally, not as easy to travel around by comparison -- especially for those traveling alone. And especially for women, who must navigate compounded factors like appropriate dress, and restrictions on where women are allowed to go and what they are allowed to do. Joining a guided tour group seems like the obvious solution, but co-ed tours in male-dominated spaces still present challenges. The presence of male tourists precludes the female ones from having meaningful interactions with locals, and from seeing how local women really live. And in Morocco, the tourism industry itself is extraordinarily male-dominated; of the approximately 4,000 tour guides here, only around 4% are women. But in the past year, Moroccan women have been taking the industry into their own hands. 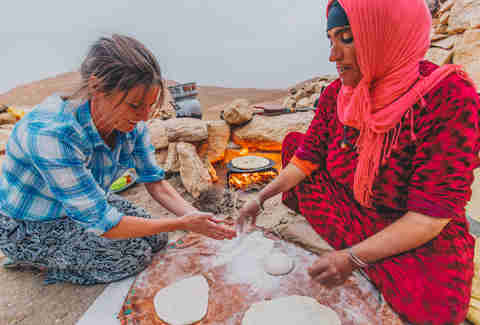 For the first time, a travel company is now offering women-only expeditions in Morocco, led exclusively by local women tour guides. Zina Bencheikh is the general manager at Marrakech Peak DMC, the Moroccan operating arm of global adventure travel company Intrepid Group. She is the only female head of a large Moroccan travel company. About a year and a half ago, she went to the Ministry of Tourism with a business proposition: women-only trips to Morocco, led by women tour guides. Tour guiding in Morocco is regulated; you must obtain a license to do it legally. Candidates are pre-screened with background checks and letters of recommendation, then required to pass a written and oral exam. Women weren’t prohibited from pursuing the license, but nor was anyone encouraging them to do so. Luckily, when Bencheikh proposed recruiting more female guides, the Ministry of Tourism was organizing a licensing test for the first time in five years. Thirteen women got their licenses. Bencheikh and her colleagues want to double that by 2020. Intrepid launched its inaugural women-only trips in March of this year (a nod to International Women’s Day). The demand for more itineraries and departure dates has mushroomed, sparking a hiring spree for more female guides. Intrepid Travel is currently offering women-only expeditions not just in Morocco, but in Jordan and Iran as well. Intrepid’s focus for these trips is immersion. Each itinerary includes opportunities to learn from local women -- from cooks, artisans, artists, hairdressers, and business owners. Those women, in turn, earn various commissions from the expeditions, for their time spent hosting and/or teaching participants. So your money is being funneled directly into the communities you visit, directly to the women you meet. Another clear benefit of women-only trips is that participants feel more at ease; they can rely on local guides to familiarize them with the customs and expectations that might be placed upon them as they tour the country. Bencheikh says all travelers should be wary of public displays of affection, too. In Morocco, it’s not customary to hold hands or kiss in front of others. “There’s also a big issue with homosexuality here,” Bencheikh says, “so two girls or two boys have to be careful; we don’t want [anyone] to be offended.” Intrepid is determinedly inclusive, but they have to work within the local laws of each destination. If you’re unsure how their gender identity and expression might be a factor, you can reach out to the bookings team and they’ll work with you individually to address your LGBTQ travel needs. The expeditions to Jordan and Iran are mainly cultural, but the Morocco trip is more active -- several days include between four and seven hours of walking. This trip sets off from Marrakech but focuses on rural areas (but no matter where you are, you’ll still have a hot shower every night). 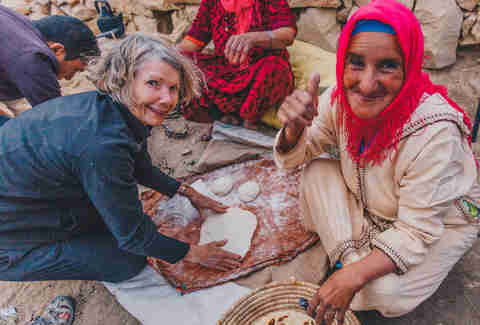 The itinerary includes a stop at a women’s rug-weaving co-op in Talsanant; a lesson in baking khobz (the staple Moroccan flatbread you’ll see at every breakfast); learning how to prepare traditional couscous; hiking into the M’goun Valley and visiting a local village; a night of Berber music and dancing in a remote mountain village; and makeup classes in traditional henna and kohl. 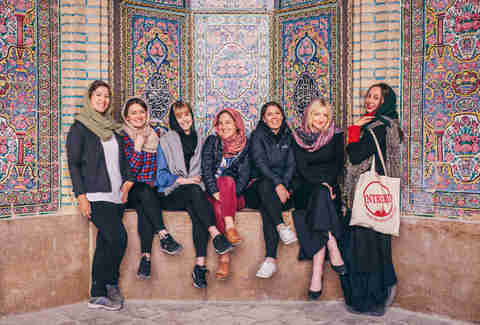 The Iran tour starts with a picnic in one of Iran’s women-only parks, which are among the only places women can gather outside without a hijab (you’ll be wearing one yourself during the trip, along with full-length pants and sleeves). 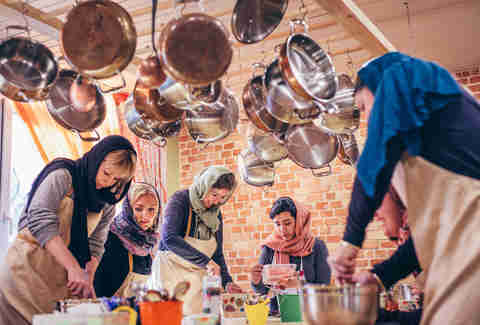 You’ll also experience the full cycle of an Iranian family meal, start to finish -- shopping at a bazaar, cooking and then eating at a family home in Tehran. 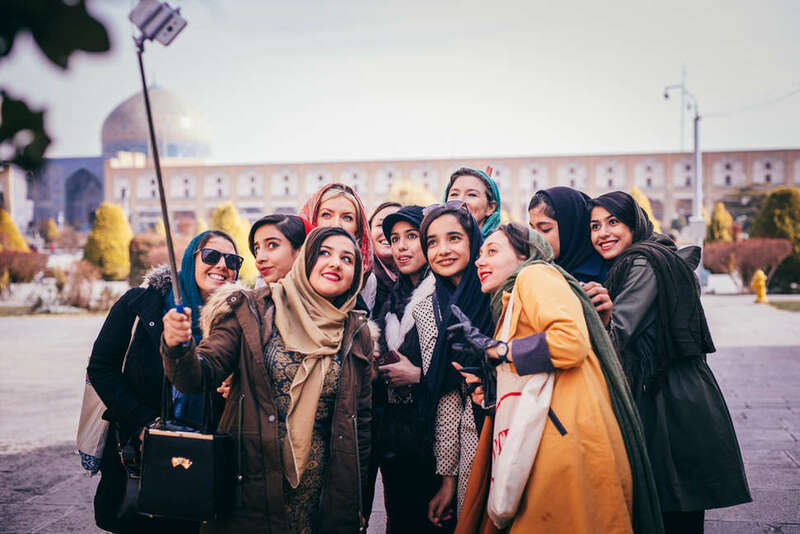 Then there’s bread-baking, a tour of a beauty salon, a trip in the women-only cars on public transportation, and meeting with the scarf shop owner to learn more about the hijab. 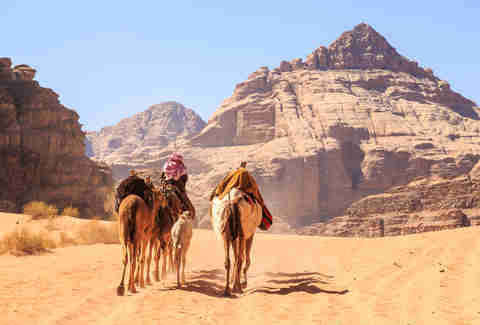 The Jordan tour takes you to places that might not otherwise be possible for women to visit alone, like desert camps in Wadi Rum that are operated by men. Among other things, you’ll learn traditional henna and kohl techniques, take a family-run cooking class, tag along with a shepherd and see how you fare milking goats, and spend an afternoon relaxing in mineral mud pools at the beach.